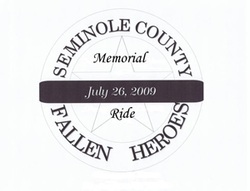 The 2009 Seminole County Fallen Heroes Memorial Ride was a sad, yet an amazing, event. The Memorial Ride was organized just a few short weeks after the murders of Captain Marvin Williams and Deputy Chase Whitebird. Since shocked and saddened by the tragedy, the Seminole County Sheriff's Department under the leadership of Sheriff Shannon Smith, the friends and families of the slain officers, law enforcement and First Responders from around the state of Oklahoma, and the citizens of Seminole County joined together to create a lasting memorial to the Fallen Heroes.